With superior cooking performance and exceptional durability, the Atosa CRCC-50S Half Size Countertop Convection Oven with Broiler and Steam Injection is a great addition to any commercial kitchen. 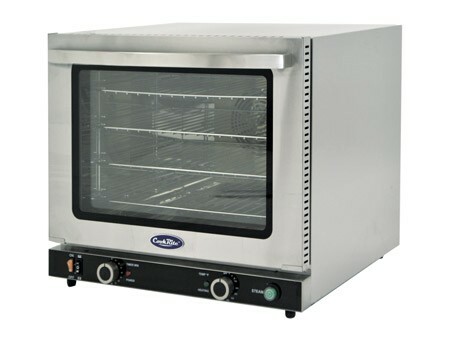 Manufactured from stainless steel, this convection oven can withstand high temperatures without warping while its double paneled glass doors create a safe barrier to prevent heat-related injury. In addition, its removable racks are easy to clean and its interior light allows you to easily check on the food. Built with a steam injection, it maintains humidity throughout the cooking process while its 150° - 500° F temperature range makes it perfect for heating up cooked foods as well as baking raw items. As an added benefit, it has a 120 minute timer that shuts it off automatically to prevent burning and its manual controls allow you to easily set the temperature according to your cooking needs. Temperature: 150° to 500° F.
Dimensions: 23" x 20" x 22 3/4"